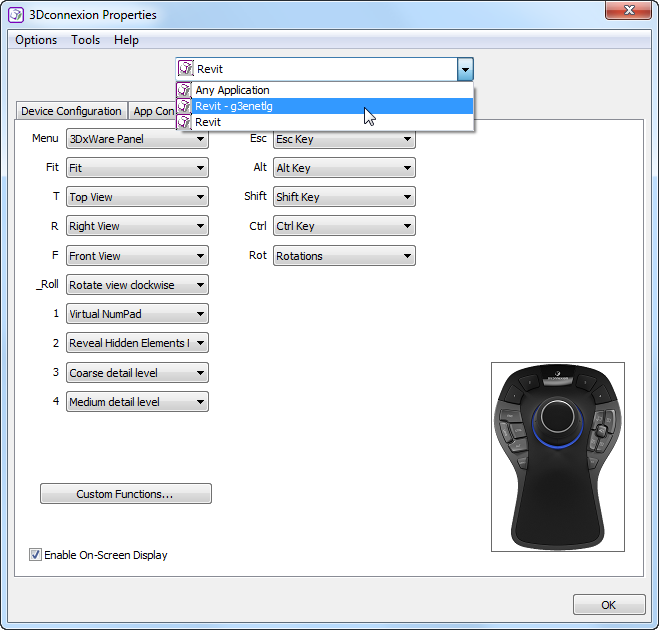 Here on the Revit Add-ons blog, we tend to focus on software add-ins for Revit, but this doesn't mean that there aren't also some excellent hardware add-ons out there that can help to increase productivity. Recently, 3Dconnexion graciously sent me one of their latest high-end 3D mice for review purposes, the SpaceMouse Pro. My overall conclusion? I would not want to work without it. The first thing I noticed when unpacking the device was how heavy it is, weighing in at a dense 1.5 lbs (.68 kg). This is because one can use the central controller knob for functions by pulling up on it. When one's hand is positioned properly on the device, the weight of the SpaceMouse Pro helps to keep it in place. This is is a thoughtful design consideration that I very much appreciated. The industrial design of the device is absolutely beautiful. It has a lot of eye appeal, and it is wonderfully ergonomic, as illustrated in the following image. To get started, I downloaded and installed the latest driver. I then plugged the device into a USB port and was off to the races. Upon first use, I was presented with a very professional interactive tutorial video that showed how to navigate a 3D model using the central controller. This was a perfect introduction: brief, to the point, and crystal clear. 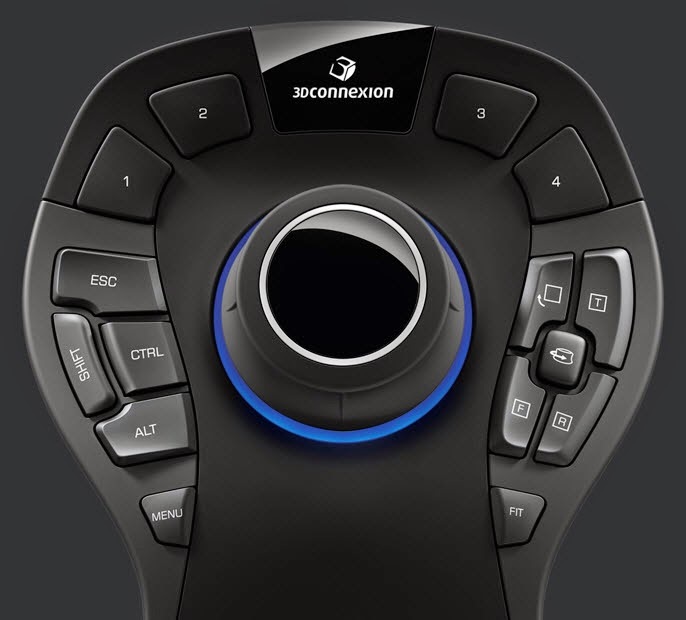 Here's a video from the 3Dconnexion website showing how to use the central controller to navigate 3D models. Please note that this is not the video that is presented when first using the SpaceMouse Pro, as that one includes an interactive 3D model. With a name like SpaceMouse Pro, I hoped that this device would do double duty by replacing my traditional mouse for use with all applications. This could be accomplished but would require some customization. 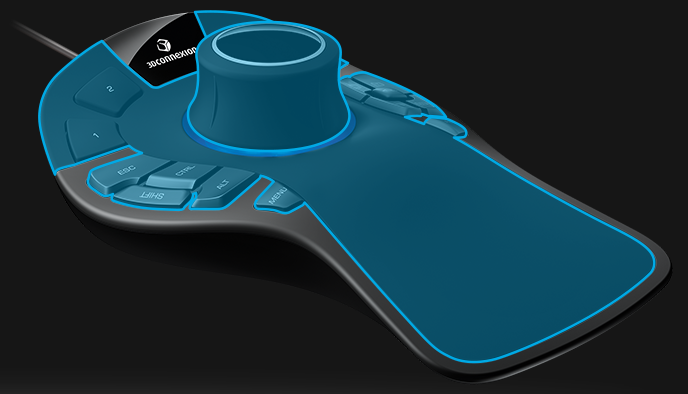 It seems that, by design, the SpaceMouse pro is intended to be a "second hand" device. Once I reconciled myself with this, I was able to setup my workstation appropriately - and, for ergonomic reasons, I'm glad that I went this route (more on this later). 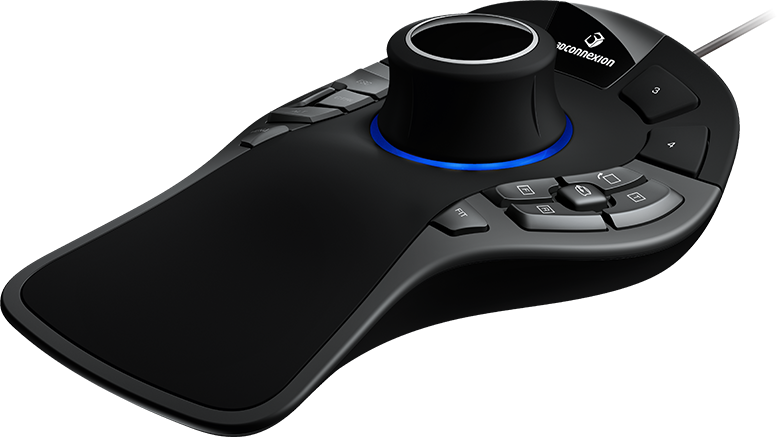 In addition to the central controller, the SpaceMouse Pro has fifteen buttons. Starting with the button on the lower left and moving clockwise, the first button is the MENU button. This button opens the 3Dconnexion Properties window, used to customize how the device responds to input (more on this later). There's then a grouping of four common "offhand" input buttons, ALT, SHIFT, CTRL and ESC. Across the top of the device, there are four "function buttons", numbered 1 to 4. These can be customized to meet your needs. In fact, all the buttons on the SpaceMouse Pro can be customized! Another nice feature is that one's customizations are automatically saved separately using your Windows log-in name. Knowing this, one can switch between the default and custom settings quickly and easily. The cluster of buttons on the right are for view manipulation, including buttons for rotating 3D model views to Top, Front or Right. It also includes a button for rotating the view 90 degrees clockwise, and a centrally-located rotation button (though I must admit that I'm at a loss for the use of this button). It's useful to know that the buttons do double duty in other software applications that have no relation to 3D modeling. For instance, in Microsoft Word, the R button becomes Redo and the button to its immediate left, F, becomes Undo. These options are stored under the Any Application configuration. Default functions assigned to "any application"
For example, I re-purposed the rotate clockwise button to Zoom Region. Note: Before creating a custom function, be sure to check the list of included functions; the list for Revit is surprisingly comprehensive. Lastly, there's a very useful and self-explanatory FIT button. The only problem that I've had with the device is that it has occasionally disconnected from my computer, sort of like it has gone to sleep and then not woken back up. This may be because I have the device plugged into a USB port that is itself on a peripheral device, and not on my computer itself. This problem is easy to spot because the blue light under the central controller isn't active. On the few occasions this has happened, I fixed it by simply unplugging the device from the USB port and then plugging it back in. By default, the zoom in and out functions accessed from the central controller function in kind of a reverse polish notation fashion (no offense intended); it is as though you are pulling the model towards you or pushing it away from you. Similarly, the pan functions accessed from the central controller act as they do in Adobe Acrobat rather than the way they work in Revit. I decided that I couldn't live with either of these behaviors. 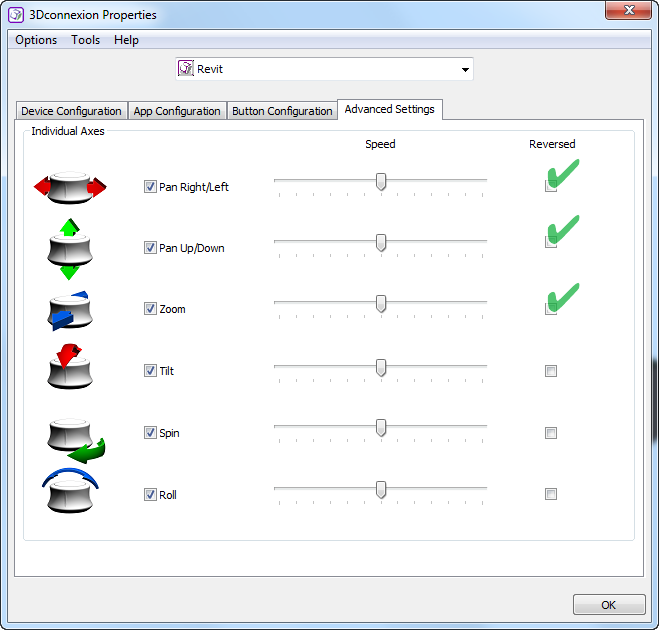 Fortunately, they are easily changed in the 3Dconnexion Properties window on the Advanced Settings pane by simply checking on the appropriate Reversed check boxes. In addition to 3D model views, I was very pleasantly surprised by how useful the SpaceMouse Pro is in 2D documentation views. And, let's face it, as Revit users, we primarily work in 2D views; we don't model so much as the program models for us. In 2D views, I use the SpaceMouse pro continuously to pan, zoom in and out, fit, and zoom region - just to name a few functions. An unexpectedly beneficial side-effect of this is that, by offloading these functions to my offhand, I have been able to reduce the strain on my primary hand. Throughout my career I have been plagued by repetitive strain injuries, and the SpaceMouse Pro has been an unexpected asset in helping to prevent further injury. 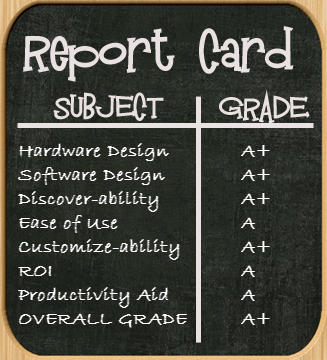 Click here for the very impressive list of supported applications. Please note that there are fourteen pages to browse through! In summary, the SpaceMouse Pro is a superb productivity enhancing device and, as a second hand device, it can help to alleviate repetitive strain injuries. I enthusiastically recommend the SpaceMouse Pro! The SpaceMouse Pro retails for USD 299.00. For additional information on the SpaceMouse Pro, please see the 3Dconnexion website.